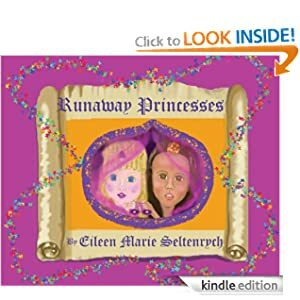 Runaway Princesses was an adorable fairy tale about two sisters who were raised in a royal family and disrespected many people and lessons they were taught. They were divas and framed the lower class and had them punishment for slight infractions. Until they became bored and decided to run away to the land of happy children they saw from the roof of their castle. They travelled along the road towards the town and tried to hide their plan to visit this town a few miles from the castle, and had to hide from hunters, the king's men and others. When they arrived they were in for a rude awakening and met shady as well as kind hearted people and learn many valuable lessons in their journey to discover happiness and many moral lessons away from home and when they returned to the kingdom, they had to prove who they were. This story was cute, hilarious and geared towards young children. It had colorful portraits made by creative author with computer graphics and it was a pleasure to read. This is a keepsake in EBook or hard cover form. “Yes, I am grateful: the itch is gone.” Biscottini said, smiling, feeling relieved. “Mother, can we sell this?” Rosehip asked. The princesses nodded their heads. “We agree,” they replied immediately. Following a quick breakfast of gruel with a little honey, and it continues on …. It was a sweet and enlightening tale and I would selected it as a gift to give to my children and grandchildren for it is written with care and concern to be shared with many. The graphics are a bonus and were a delightful addition to the story and .they could be used to teach art lessons by hand or research together how one could use computer technology to create their own pictures and story or to be shared with your loved on as entertainment of fun-time. She is also an awesome artist and now an advocate for innocent children in the middle of a custody battle, so check out her books and the petition help victims of Domestic Violence, October is the month of DV awareness.